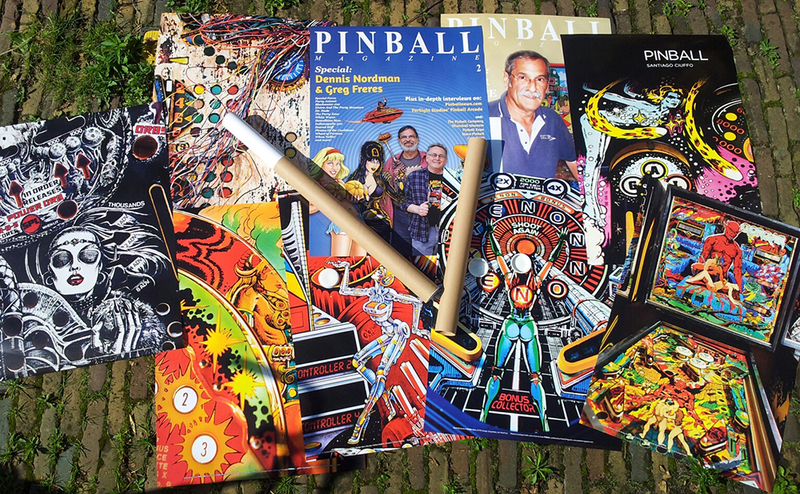 New in the Pinball Magazine webshop: pinball posters. Besides the covers for Pinball Magazine No. 1 and 2 and the cover of Santiago Ciuffo’s PINBALL book, there are also six posters of photos by Santiago ciuffo. Five of these have been published in his PINBALL book. The sixth poster shows a backglass deatil from Pin-Bot and has not been published in the book. Please note there is a discount applicable when ordering 3 or more posters. This discount grows for each three posters added to your cart. The discount isn’t displayed when ordering, but is listed in Checkout. After entering your address the shipping costs will also be shown. Please not that the posters will be shipped in solid cardboard tubes, which can hold up to 9 posters in total. Shipping for 1 to 9 posters is the same, so it’s recommended to order more than one poster simultaniously as that is cheaper than ordering them seperately. Please also note that when ordering posters and magazines or books the posters and books / magazines will be shipped as two packages.